This value of the Hubble constant is just an estimate, as it is hard to measure the distances and radial velocities of the galaxies accurately. For all of the nearby galaxies whose distances are known fairly accurately the radial velocity predicted by the Hubble formula is small, and random velocities due to their local motions are comparable to or even overwhelm the expansion velocity. For more distant galaxies, where the Hubble velocities are large enough to ignore local motions, the distances are not well known. Different ways of trying to compensate for these problems lead to different estimates for H, ranging from 50 to 100 km/sec/Mpc. In other words, the value of the Hubble constant not only tells us how fast the galaxies now appear to be going away from us, but also implies a specific "age" of the Universe (or, more accurately the approximate length of time that the expansion can have been going on at the current rate). The value of 65 km/sec/Mpc implies an "age" for the Universe of 15 billion years. This agrees well with theories of stellar evolution and death, which imply an age of 12 to 13 billion years for the oldest stars in the galaxies, but if we were to accept other values of the Hubble constant (between 50 and 100 km/sec/Mpc), we would get other values for the "age" of the Universe (between 10 and 20 billion years). Since the Hubble theory explains the redshifts of the galaxies with an expansion which must have a finite age, and implies that the Universe itself may be of finite age, there have been attempts to explain the redshifts without resorting to actual motions of the galaxies. However, none of the explanations suggested in the more than 70 years Hubble discovered this relationship seem to be able to explain all of the data, and most astronomers believe that the Universe must indeed be expanding, and must have been doing that for only a finite length of time. If the Universe is indeed expanding, then at some time in the past all of the galaxies that we can currently see must have been in a much smaller space. It is not possible to be certain how much smaller that space might have been, but even if it were several million light years across, putting all of the galaxies that now lie in a region 30 billion light years across into that much smaller region would make it extremely dense and hot. This is the reason for the suggestion, originally made in the 1930's, that the Universe started out as a very small, very dense, very hot region, which violently exploded outwards in all directions. Although several other theories, most notably the Steady State theory, have been suggested over the years, the Cosmic Fireball, or "Big Bang" theory is overwhelmingly accepted nowadays, because it makes specific predictions about the current nature of the Universe which appear to be well borne out by observations. One of these predictions has to do with the current composition of the Universe. Since the original state is supposed to have been so hot, matter as we know it could not have existed at that time; instead, the Universe would have been made of some strange, primordial stuff, called ylem (a deliberately strange name, intended to emphasize its strange, and perhaps unknowable nature). As it expanded, the Universe would have cooled off, and the ylem would have turned into more normal forms of matter. Nuclear physics can calculate the ratio of different types of atoms which would have resulted, depending upon the actual conditions which existed at the time when normal matter began condensing from the primordial matter. The predicted composition of the Universe is 90% hydrogen atoms, 10% helium, and practically nothing else, and this is just what we observe. Of course, there is some other material, but we believe that this has all been made inside massive stars, and released to the interstellar medium by supernova explosions. The oldest stars in our Galaxy have very little stuff in them besides hydrogen and helium. Only the younger stars have substantial amounts of heavier materials, and the younger they are, the more heavy stuff they have, which is just what we would expect if the heavy stuff is still being made. The composition of the heavy atoms is just what we would expect if they were made by supernova explosions, and that, and the apparent increase in the amount of heavy atoms over time, seems to confirm this particular theory of the creation of the elements. Another prediction has to do with our view of the most distant parts of the Universe. If the Universe is only 15 billion years old, then we cannot see any regions which are more than 15 billion light years away from us, because the light from those regions would have had to leave there before the beginning of the Universe in order to have reached us by now. In fact we cannot even see that far away, because when we look that far out into space we are looking back into time, and if we look far enough out we would be looking at the Cosmic Fireball itself. In the earliest part of the Big Bang, the Cosmic Fireball was so dense that light created in one part of the Universe could not get anywhere else, so if we were trying to look at that part of the Universe it would be opaque and impossible to observe, but as the Universe expanded there came a time when the light could "leak" outwards from every part of the Universe to every other part, and so we ought to be able to see the light that was emitted at that time still running through the Universe, just as it was when it was emitted 15 billion years ago. In the late 1950's it was discovered that we actually do see radiation, in all directions in the sky, which looks like the black-body spectrum of a hot, glowing surface, and might be the radiation from the Cosmic Fireball, but the radiation is not what you might expect from a surface at nearly a hundred million degrees (the temperature that the Cosmic Fireball would have had when it became transparent), because the regions from which it appears to be coming are so far away that their velocity away from us is almost as large as the speed of light. This causes a Doppler shift which converts the radiation from an original spectrum characteristic of very high temperatures, to a microwave spectrum corresponding to an apparently very low temperature. The original prediction was that the microwave background spectrum would correspond to a temperature near 3 Kelvins above absolute zero. The observed spectrum fits a temperature 2.7 Kelvins above absolute zero, in good agreement with the prediction. Until recently it was not possible to determine whether the Universe is actually slowing by looking at the motions of the galaxies, because as discussed above galaxies which are far enough away so that their expansion velocity is much larger than their random local motions were too far away to make accurate estimates of their distances. So another method had to be used to determine what might or might not have happened since the Big Bang. That method involves looking at the amount of mass in the Universe to see if it is large enough to gravitationally slow the expansion. It is fairly easy to calculate (using the theory of General Relativity) just what density (mass per unit volume) the Universe has to have in order to stop the expansion. If the observed mass is much less than this, then the expansion should never slow down. If the observed mass is much more than this, then the expansion should stop and reverse itself. To estimate the actual mass in the Universe, we can count the galaxies in various regions of space, and estimate their masses using whatever techniques are currently available. When this was first done it was discovered that the mass of the galaxies is about 100 times less than the critical density, implying that the Universe should expand forever. Unfortunately, there were some other problems of galaxy dynamics that suggested that this result was not correct. Throughout the Universe there are large clusters of galaxies which are presumably gravitationally bound together, because the random motions of the galaxies in the cluster (measured by the Doppler shifts in their spectra) are much larger than normal random velocities, just as though their mutual gravities were pulling them back and forth relative to each other. But in every case the fastest motions were too big to be explained by the gravitational pull of the galaxies if the total masses of the galaxies are as small as the early measurements. This led to the theory of "missing" mass, or "dark" matter. This mass is either really missing or not there, in which case we have to explain the high velocities of the galaxies in the clusters by some currently unknown method, or it is really there but we're somehow missing it with the standard methods of observation. The amount of missing mass needed to explain the motions of galaxies in clusters of galaxies is 10 times as much as the early estimates of the entire mass of the Universe. If we could be off that much, it is conceivable that we could be off by the factor of 100 required to reach the critical density, and so the Closed-Universe proponents seized upon the cluster-mass problem as a proof that the observations of apparently low masses for the Universe could be wrong. As it turns out, over the years we have discovered that most galaxies, including ours, have large, faint outer regions (the halo, or corona of the Galaxy) which were not noticed in earlier studies, and that the galaxies are therefore much more massive than we used to think. This has pretty much eliminated the problem of the missing mass in clusters of galaxies. Most of them now have mass estimates which agree very well with the observed galaxy velocities; in those few cases where there is a problem, only one or two galaxies out of all those in the cluster have excess speeds, and it is at least conceivable that they just acquired those high speeds by a near encounter with some other cluster member. But even with the increased estimates of the masses of galaxies, there would still have to be another 10 times as much stuff in space to reach the critical density. It does not appear to be possible to explain another 10 times more mass by looking for it inside the galaxies, as in those galaxies which are close enough to study their outer regions in some detail, the amount of stuff in the outermost reaches of the galaxies is definitely falling off, implying that the total masses cannot be significantly increased still further. So if the Closed Universe theory is true, there would have to be large amounts of unknown stuff in between the galaxies. In fact, this has been the favorite proposal of the Closed Universe proponents all along. They suppose that the galaxies only appear to be where the stuff of the Universe is, and that there are huge amounts of "dark" matter scattered throughout the regions between the galaxies. The main problem is, what could this be? It can't be hydrogen or helium or any other material that we're familiar with, because if it were we could see absorption or emission caused by it in various ways. In fact it can't be any form of matter that we're familiar with. As a result, it takes quite a leap of faith to still believe in the dark matter, or missing mass. One of the reasons that many astronomers are willing to take this leap is that one of the most popular variations on the Big Bang theory predicts that there should be much larger amounts of matter in the Universe than we seem to observe. This is the Inflationary Universe model. The reason that this model was proposed is that the microwave background (the "light" left over from the Cosmic Fireball) is very uniform in its brightness, varying by less than 1/100 of a percent in its brightness and spectrum in various directions. But it turns out that if, when the Universe was expanding, different parts were expanding at different rates or with different densities or temperatures, then the spectrum and brightness of the microwave background would be slightly different in different directions. Since this is not the case, it means that at the time that the Universe was becoming transparent conditions were still very nearly the same throughout all the region now visible to us. But that is difficult to understand if, at that time, the stuff was spread out over hundreds of thousands of light years. So the proposed explanation is that the Universe was even smaller than we used to suppose, so that there wasn't enough difference in the position of things to allow differences in the initial conditions. Just how small we have to make the Big Bang in order to do this is not clear, but the Inflationary Universe model takes the contraction to the ultimate, making the entire Universe smaller than the nucleus of an atom. 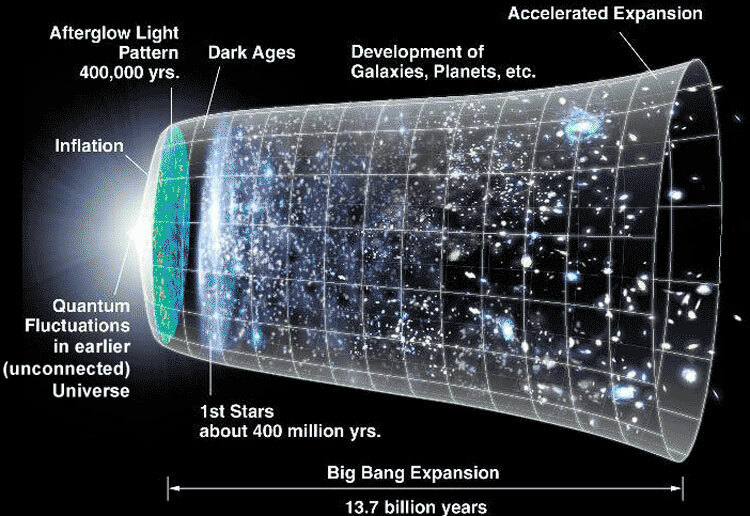 This theory is called the Inflationary Universe model because it supposes that during the first instant of the Big Bang the Universe expanded at speeds much faster than the speed of light, using energy derived from a "phase" change from a "supercooled" state of nothingness/chaos to the current normal state. But if this theory is true, then the energy of the proto-Universe is so large that a very large amount of mass is created in the normal Universe that results, and in fact an amount the mass is so close to the critical mass of the Universe that although the Universe would expand forever, it would be so closely balanced between eternal expansion and eventual contraction that no direct observation of its characteristics would ever be able to tell us that its mass is not actually equal to the critical mass, but just slightly smaller than that value. Now if you like the Inflationary Universe model, then you have to suppose that just as the Closed Universe proponents do, there is a lot more stuff in the Universe than we can now observe. This has given fuel to the missing mass problem just when the cluster-mass problem had-been solved, apparently ending the controversy. Unless some other theory of the formation and evolution of the Universe comes along, the Inflationary model is going to continue to lead many astronomers to suspect that there is a lot of invisible stuff out there. Of course that theory may be wrong. And there is one more piece of data concerning the density of the Universe that seems to indicate that there is some problem with it. That is the abundance of deuterium. Deuterium is a form of hydrogen with a neutron and a proton in its nucleus instead of just a proton. Small-mass stars like the Sun create deuterium in the process of turning hydrogen into helium, but they use it up just as fast as they create it; and massive stars, which are the ones which put new stuff back into the interstellar medium when they supernova, don't use the same method of burning their hydrogen, so they don't even produce deuterium in the first place. As a result, all of the deuterium that exists in interstellar space must have been there since the start of the Universe. And it turns out that the amount of deuterium created at the time of the Big Bang is very sensitive to the density of the early Universe. The reason for this is that it is much easier to "burn" deuterium than to burn ordinary hydrogen. As the Universe cooled and expanded, there would have been a (short) time when almost all of the stuff in the Universe was hydrogen. But at that time the temperature would have been very high, and so the hydrogen would have turned into deuterium at a fairly rapid rate. As fast as the deuterium was created it would have turned into helium, so that eventually 10% of the atoms were turned into helium, as stated earlier. But at some point, as the Universe expanded it would have cooled off to the point where all of these nuclear reactions would have been cut off (that's why there wasn't much stuff created beyond helium). If, at the time that that happened the density of the Universe was very high, so that the deuterium atoms just created didn't have to go very far before running into something else and being turned into helium, then there would have been hardly any deuterium left at the end of the Big Bang. But if the Universe was much less dense at that time, then the deuterium atoms would have had further to go between collisions that created and then destroyed them, and so there would have been more of them running around in between at any given time. The result is that the denser the early Universe was, the less deuterium would be running around then and now. So by looking at the amount of deuterium we can estimate the early mass of the Universe and see how it compares with our current estimates. The observed value of deuterium predicts that the total amount of stuff in the Universe should be 10 times less than the critical mass, in agreement with the actual observations of galaxy masses. In summary, most observations seem to indicate that the mass of the Universe is far too small to ever stop the expansion, but many theoretical physicists and astronomers would prefer to believe otherwise; and it will probably be many years before this controversy is laid to rest. (2) Massive stars don't last very long, because they are very bright and use up their energy supplies very quickly; while less massive stars, which are fainter, use up their energy supplies very slowly and last for a much longer period of time. Because of this, when we look at Hertzsprung-Russell Diagrams for star clusters which were formed at different times in the past, the younger clusters have relatively bright stars still shining normally, while the older clusters have only fainter stars still shining (the brighter ones having already died and become essentially unobservable). The Main Sequence has a top, or turnoff point, which is near the top of the Diagram for young clusters and near the middle for older clusters. Many presumably old clusters have a turnoff point which is below the position of the Sun, indicating that stars like the Sun which once existed in those clusters are already dead. Since the Sun is not yet dead, the clusters must be considerably older than the Sun. Just how much older than the Sun are the oldest stars? That depends on how long the Sun can last. Current models of the Sun calculate that about half of the hydrogen which is powering it has already been used up. Depending upon how its brightness changes as it ages (which is a matter of minor debate) and how the nuclear reactions in its core change (which is a matter of slightly greater debate) the Sun can last about 10 billion years, or at least somewhere between 9 and 12 billion years. Since the oldest star clusters are perhaps 2 to 5 billion years older than the Sun, that would make them between 11 and 17 billion years old, and (depending upon how long it took stars to form after the Big Bang) would make the Universe itself somewhere between 12 and 20 billion years old. Now remember that with current estimates of the Hubble Constant ranging from 50 to 100 km/sec/Mpc, the "expansion age" of the Universe is between 10 and 20 billion years. So, although there is a considerable uncertainty in the numbers, the age of the oldest stars overlaps the expansion age of the Universe, and until both sets of numbers are far more accurate we should probably not be too worried about any conflict between them. The source of the current "problem" is that the expansion ages which I have been quoting are based on the assumption that the mass of the Universe is far too small to affect the expansion rate, so that it has been expanding at the same rate as now ever since the Big Bang (and of course the main point of the first part of this discussion was that the normal mass is far too small to affect the expansion rate, and that there is no good reason to believe in the existence of the so-called "dark matter" which theoretically makes up 90% or more of the mass of the Universe.) But suppose that this is wrong, and that the Universe does contain a huge mass of dark matter, which is continually slowing down the Universal expansion, so that it is now much slower than it used to be, and will eventually be much slower than it is now. In that case, since the expansion was faster in the past than now, the Universe would have reached its present size not in 10 to 20 billion years, but in only about 2/3 of that time, or 7 to 13 billion years. As shown by this "graph", the low-mass Universe age estimates overlap the entire range of possible star cluster ages. But the high-mass Universe age estimates only overlap if the stellar age estimates, and the expansion age estimates are made as high as possible. This makes things a bit worrisome. So, if you believe that the Universe is made up mostly of "dark matter", and that the normal matter is only 10% or so of the actual mass, then you have to believe that the Universe is at least a billion years younger than the oldest stars, and perhaps as much as several billion years younger. But that is not possible! So this is simply one more (very important) reason for believing that the "normal" mass of the Universe is all (or essentially all) of the mass of the Universe. The expansion of the Universe according to "recent" (2006) observations and calculations. Time is shown increasing to the right with the beginning of the Universe at the left, and the current era at the right; while the "size" of any given part of the Universe is shown vertically, in a greatly compressed form (the actual expansion is many millions or billions of times greater than shown here). In the beginning, the Universe was created as a point-mass of zero size, zero age, and infinite density, mass and temperature. In a hundred billionth of a trillionth of a trillionth of a trillionth of a second after its creation it grew at a nearly infinite rate, to become billions (if not billions of billions) of light years in size. In this so-called Inflation, quantum fluctuations that existed in the zero-size singularity at the beginning of time and space caused small differences in the mass and density of different regions, which are seen in the microwave background, which is the remnant of the intense radiation which existed everywhere in the Universe during its Cosmic Fireball or Big Bang stage of evolution. The angular and brightness fluctuations seen in the microwave background exactly match the predictions of comological theories based on this scenario, indicating that it is more likely to be correct than not. As mentioned in the above discussion, a few years ago it was shown that the dark matter could not possibly be as abundant as people wanted to believe, or else the Universe would have had to be far younger than the stars. But how this problem would be solved was uncertain. Basically, there were two ways. First, the Universe might not be, as commonly stated, "flat". In the Inflationary Model of the Universe the idea is proposed that the Universe starts off incredibly small and expands incredibly fast to a virtually infinite larger size. When small it is "round", but as it grows it becomes "flatter". Think of the Earth as an example. It is round, but it looks flat because it is so large. In the standard Inflationary Model it is presumed that as the Universe grows it gets so large that it must be incredibly flat. But unfortunately, things are not quite that simple. In our experience, as round things get bigger they can only become flatter. But in Einstein's theory of General Relativity, if things grow enough they can go beyond "flat" to "hyperbolic", and if the Universe has grown enough, then the mass of the Universe is much less than the so-called "critical" mass, and the amount of dark matter is no longer a problem. However, if this is true then, according to Einstein's theory, the Universe cannot be either slowing down or "coasting" along at nearly constant speed to larger sizes, but must be growing bigger and bigger at a faster and faster rate. And until recently, although that was considered a theoretical possibility it seemed impossible to ever prove that it might be right, at least with anything resembling current technology. However, about 2 years ago a new way of fairly accurately measuring the brightnesses of a particular type of supernova, referred to as a type Ia supernova, was discovered. (A type Ia supernova results from the catastrophic explosion of a white dwarf which has a companion which has covered the white dwarf with nuclear material, and the white dwarf suddenly, violently, burns all of that material and its previous material, and blows itself to smithereens.) Since then, several studies of the brightnesses of type Ia supernovae at various distances (and therefore, different look-back times in the past history of the Universe) have shown beyond any doubt that the Universe is expanding faster and faster, and has been doing so for at least the last 10 billion years of its history. As a result, the Universe is not "flat" in the sense that it had been considered to be, but "hyperbolic", and its mass is much less than the critical mass. Because visualizing hyperbolic space is difficult for non-mathematically minded students, current texts and media discussions still pretend that the shape of the Universe is "flat", but say that it is made of three types of stuff. One is normal material, visible and invisible, which makes up somewhere between 1 and 5% of the "critical" mass of the Universe, depending upon whose numbers you believe. The other is "dark matter", which is by definition completely unobservable in any way that we can currently think of, and that makes up between 20 and 30% of the "critical" mass of the Universe, according to most of the numbers thrown around, but we literally don't know if this stuff even exists at all, although there are some compelling reasons (beyond the scope of this brief discussion) to think that it may exist. These two forms of matter, "real" normal matter, and "real or imaginary" dark matter, are the only matter in the Universe, and together they make up at most 30% of the critical mass, and probably far less than that. If you use a hyperbolic geometry for the Universe that's the end of the story, but if you want to pretend the Universe is flat you have to add another 70% of "non-mass", which is called "dark energy" or "funny energy", and is an imaginary number which corresponds to the current rate of expansion and acceleration of the Universe. If you use a hyperbolic geometry for the Universe, you would say, "Look at how fast the Universe is expanding, and imagine how much faster it will expand in the future. Isn't that amazing?" If, instead, you use a "flat" geometry for the Universe, then you say "The expansion energy of the Universe is much bigger than the mass-energy, even counting the dark matter that we used to think was practically everything in the Universe. Isn't that amazing?" Either way, the Universe is a pretty amazing place.